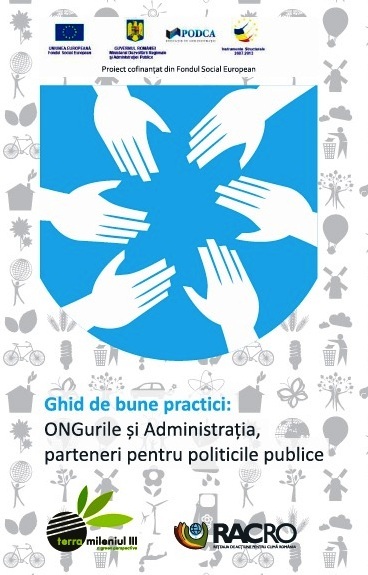 The good practice guide “NGOs and administration: partners for public policy” is a tool designed for all stakeholders in monitoring or development of public policies in Romania. Public participation is a key element of a healthy democracy, increasing the quality of decision making process and the legitimacy of decisions through the citizens’ support. Although the consultation process in Romania is regulated, it is usually made only on paper. Both NGOs – as organized civil society – and public authorities need support to implement effective communication tools and consultation and to benefit from the advantages of real public participation in the decision making process. This guide is the result of documenting and synthesizing several types of practices that can be used in the public consultation process in Romania. It contains essential information on NGOs working with authorities in Romania, as well as examples of best practices and recommendations collected from European NGOs. The document was developed by our colleagues from the Resource Center for Public Participation.